I am a happy yundoo y8 user. The android 7.1 is working quite well for me... but... I wanted to try linux and I think I have bricked the Y8. After this, at power on with the red light is not switching to blue nor it boots. Recovery mode (the button hidden inside the audio jack) is not working: the device is not detected in the USB with rkflashkit (before flashing it was appearing). With the console cable in place, I was able to determine that "mask rom" was not being entered. I used a piece of wire to short the test points and reset the device until it appeared over USB. At this point I was able to erase and re-flash it with the Ubuntu image. For anyone else that experiences this, the tip is to make sure you have good contact on the test points. Also, its much easier to press the reset button while shorting the pins than it is to plug/un-plug the power connector. 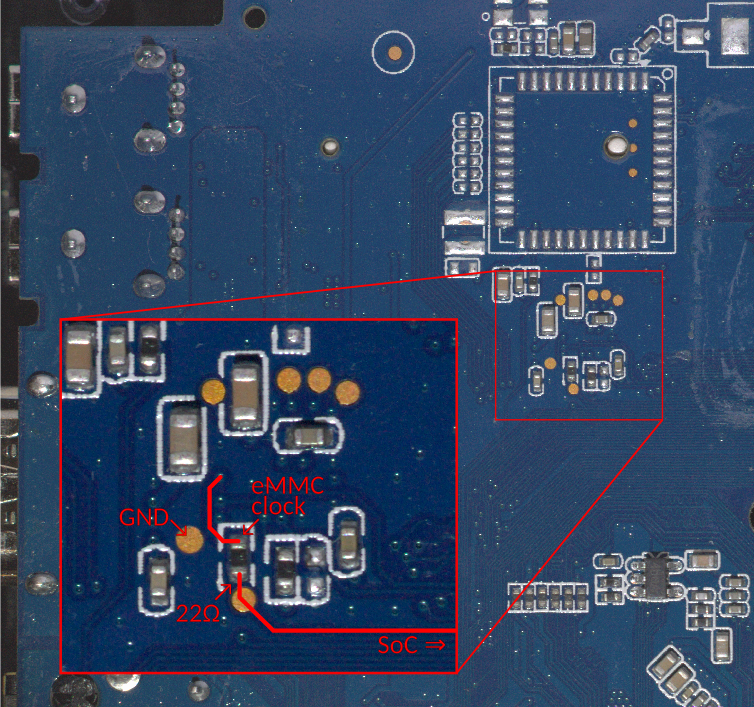 If I shortcircuit the GND to the above ending of the resistor, the one that is pointed by the eMMC clock's arrow, then I get no log at all in the TTY terminal and the USB-C doesn't become accessible either. So, I shortcircuited the points GND and the other copper point in the image beside the 22ohm label (the one below the resistor) and the emmc seems to be not accessible. Also, some kind of reset seems to happen, but when I release the points, the Unhandled Exception in EL3 hits again. After this I don't know what to do. EDIT: I made a backup for all the partitions with rkflashkit before flashing the linux image. Does anybody knows how to solve this issue... or... is my Yundoo Y8 bricked forever? Got it back to life! * Maskrom points are the one marked with GND and eMMC Clock (the resitor end closer to the GND copper point) in the above image. (08-24-2018, 04:33 PM)gatos814 Wrote: Well done ,for you! BTW, do you know if it is possible to flash the ubuntu 16.04 image for firefly rk3399 (I have Firefly-RK3399-ubuntu16.04-20180416112819.img ) in the Y8? Do you know if I could flash this image with other tool? Since firefly RK3399 and Yundoo Y8 have so similar hardware. I wish it is possible that it will work, but I dont find much info in the net. Also ROCKPro64 and NanoPC-T4 development boards offer linux support for RK3399 and have public images for ubuntu 16.04 / 18.04. Armbian is supporting the RK3399 for ROCKPro64 aswell. Does anyone here have some stories to share? Otherwise I might start flashing linux images until I definitively kill the Y8 forcing myself to buy something that I was expecting in the 1st place: a RK3399 device with linux support. Sorry i don't have this tv box!